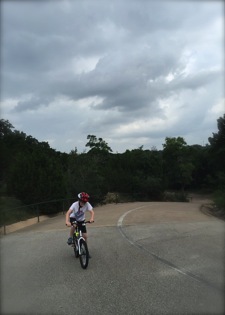 Biking on smooth pavement in the Hill Country sans cars makes an outing to the Veloway worth the trip, especially for young bikers. The 3-mile loop (that can be shortened to 1 mile with a shortcut) winds through wooded scenic green space in the Circle C Metropolitan Park just up the street from the Lady Bird Johnson Wildflower Center. It's mostly flat with just one steep hill that might require younger bikers to hop off and walk. Open exclusively to cyclists and skaters, the trail runs one-way in a clockwise direction, with slower traffic staying to the right. Picnic tables and open areas along the way provide good rest stops, or keep pedaling and enjoy the fun of being on a road with only human-powered traffic. If you can, go on a weekday when the trail is less busy. Portable toilets and a water fountain are located near the entrance. Dirt parking lot on site.